Manufacturing of part using CNC milling machine starts with making a completed 2D and 3D drawings of the part which is need to make the CNC code. CNC code for part contains the path of tool which depends on part geometry, feed rate and cutter rotation speed. Types of milling cutter used in part manufacturing depend on the initial condition of raw material provided; part mounting method and construction of cutter. There are no rules for deciding cutter speed but there are some factors like cutter type, shape and cutting conditions that affects the speed of milling cutter. There are certain tables made on previous experiences that suggest what could be the right speed for a particular tool. Like speed of cutter there is no certain rule to select the feed rate of milling machine. Feed rate suggestion tables are available which show only the suggested speed depending on the depth of cut, material of work-piece/tool and surface finish required. Types of milling (up or down milling) really decide the quality of surface finish. Down milling provides the best surface finish for part. 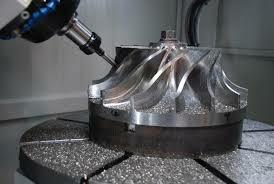 The size of the part that you can manufacture from the CNC milling depends on the size of the bed of milling machine. If part size is too big you can manufacture it two equal half and then join them by locking pins. Production rate of the CNC milling machine depends on the quality of the CNC code and geometry of part. With simple part geometry and quality code, CNC milling machine can give very high production rate. Milling machine has usually poor material usage and the waste material in the form of chips cannot be recycling directly. Milling machine have high flexibility which enables it for quick response to any change in part design and therefore it is usually selected for low production volume jobs especially in this project. CNC milling is costly process for the manufacturing of simple part because of high tooling cost, equipment cost and skilled labor cost. part surface finishing process is usually not required after CNC milling manufacturing process. Skill labor is required for the selection of required coolant, feed rate, cutting tool and cutting speed with respect to material of part. To avoid deflection during machining, rigidity of the milling machine, milling cutter and work-piece is required. Coolant is used to remove the flush swarf from the cutting area and safe the cutting tool from overheating but still daily inspection of cutting tool is required for its proper function. Surface roughness of 0.2 to 0.25 micrometer can be achieved. The unmatched performance of CNC milling machines has always impressed me as an industrialist, as I have used it personally, on several occasions, while providing training to my workers.